What does it mean to be human? To be human is to be part of God’s gift of creation. It means to love and be loved, to live in family, to have friends, to be male or female, to make choices and promises, to be happy and sad, to work, to succeed and to fail, to participate in society. The list is endless. All these human experiences are explored in Fully Alive. Created and Loved by God" is the opening theme of Fully Alive, and it is like the foundation of a house. Everything else depends on it. As Christians, we believe that God creates, loves, and sustains each one of us. 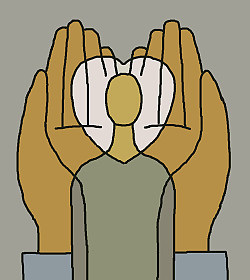 To be human is to be created in the image of a loving God. This image is revealed to us in Jesus Christ. God made and loves each one of us, yet we are different from one another. These differences are discussed in Theme One. It is important for children to know that it is good to be who they are. It is also important for them to know how much they share with all people. Like them, other people have feelings, opinions, talents, needs, strengths, and weaknesses. And, like them, other people are worthy of respect. Everything that happens to children, whether at home or at school, has an effect on the way they see themselves and on the way they treat others. Self-acceptance and respect for others begin at home with loving parents. And it is through loving parents that children come to know and accept God’s love. Theme One of Fully Alive is designed to complement the efforts of parents so that both the home and the school are places where each child can flourish. 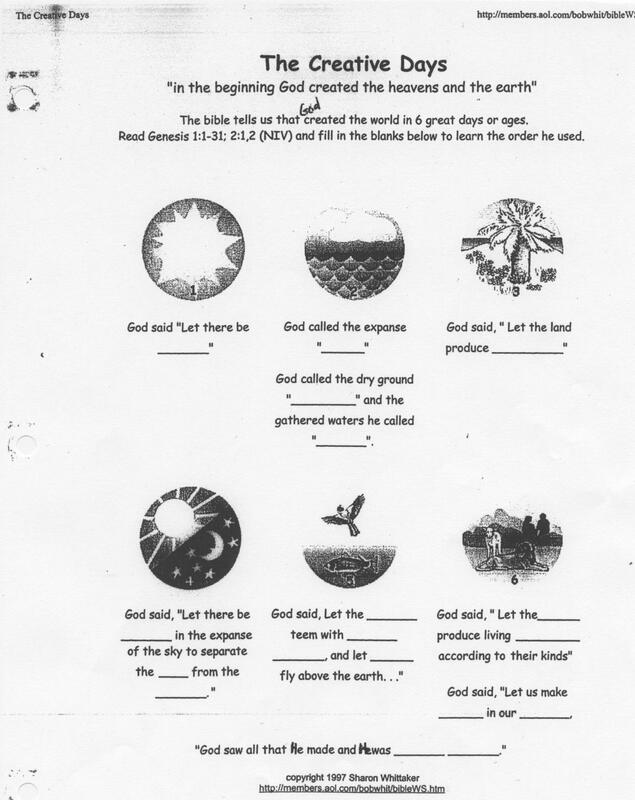 Today we looked at “Creation” as described to us in the Bible. We discussed what God created and possible interpretations for words such as “day - On the first day…” as perhaps meaning an “era” of time rather than the modern interpretation (24 hours). We looked at the progression of the creation from light to water to vegetation to weather to animals to land and eventually the most sophisticated of God’s creations “humans”. This is where the first unit of Life Curriculum picks up and it forces us to examine the special unique role God has for humans as the guardians of his other creations. 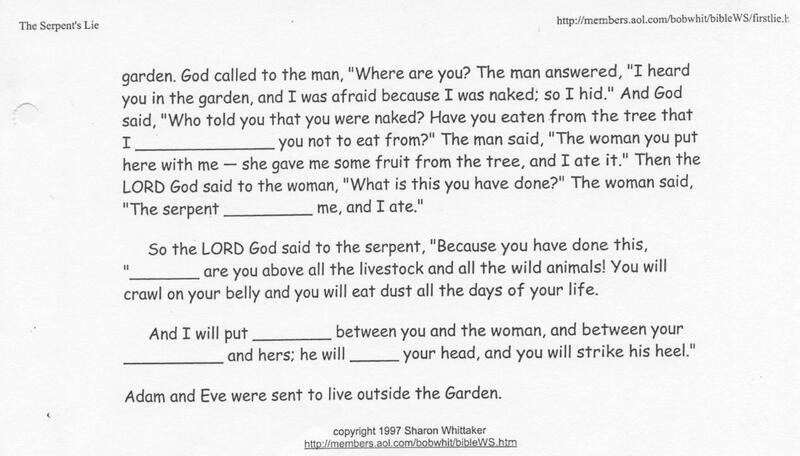 Today we looked at the biblical story of Adam and Eve and discussed the role of the "serpent" in tempting the characters of the story to act out against God's wishes. We discussed that curiosity is an innate human trait ("get your hand out of the cookie jar") and that neither Adam or Eve ever considered disobeying God until they listened to the serpent and allowed evil into their lives. The unveiling of their nakedness (and other less desirable traits ) were initiated upon their gaining knowledge about the world (tree of knowledge) - "and the eyes of the two of them were opened.". This story also explains the expulsion of Adam and Eve from Paradise as a consequence for disobeying God's wishes. This brief period of time (which accounts for the years we spend on Earth) provides an opportunity for humans to prove their worthiness of reentering Paradise when we pass on from this world. The original sin, imposed on us by God in the Garden of Eden for the actions of Adam and Eve, coupled with our own worldly sins must be rectified with God through obedience and kind acts while we live on Earth. If the life we lead is pleasing to God we are permitted to join him in Paradise upon our death. We use these stories are stepping stones to help in the examination of what makes humans unique amongst God's creations. 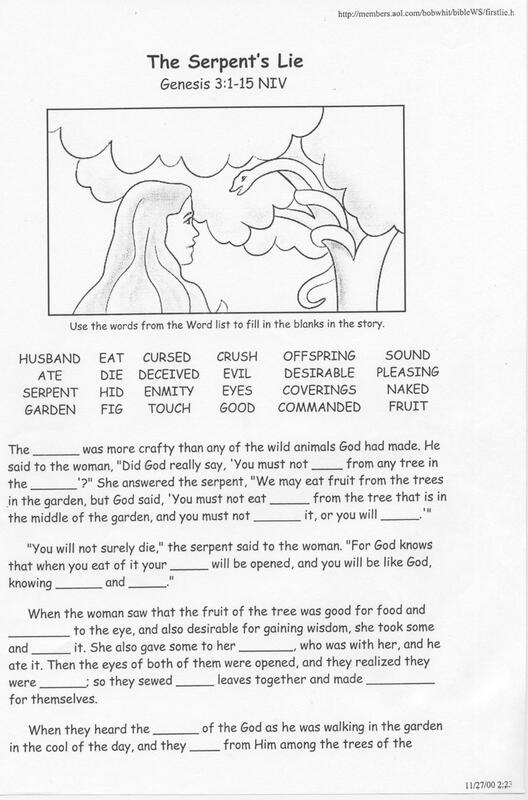 Students were asked to complete a "close reading" (fill in the blanks) activity sheet about the story of Adam and Eve and secure this page into their notebooks. The human mind is a special gift which allows us to perform at marvelous capacities. Each person, whatever his or her limitations, has the abilities of creative intelligence and free will, which are meant to be used thoughtfully, responsibly and fully. Some young people struggle with self-doubt and self-consciousness at the onset of adolescence. Although they may be resistant towards the effort that is required to develop fully, if they can find the initiative they can truly discover "the wonder of being human". Humans have created some incredible things throughout history. Watch the following clip that takes a virtual tour of the original "Seven Wonders of the World." Each of these structures were completed thousands of years ago, by humans with much less technology at their disposal than today. 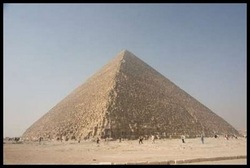 Note: The only structure that still exists is the Great Pyramid of Giza. Students were asked to select their own personal "Seven Wonders of the Modern World." They were to consider objects and structures that they use everyday, that they have little to no understanding of how to recreate if it wasn't available to them. Example, the cell phone or televisions. All humans have the capacity to learn. Although there are differences in our individual abilities and talents, the development of those abilities and talents is the challenge God offers each of us. Students are asked to explore the mental abilities of Learning, Remembering, Reasoning, Creating, Feeling and Acting Freely. 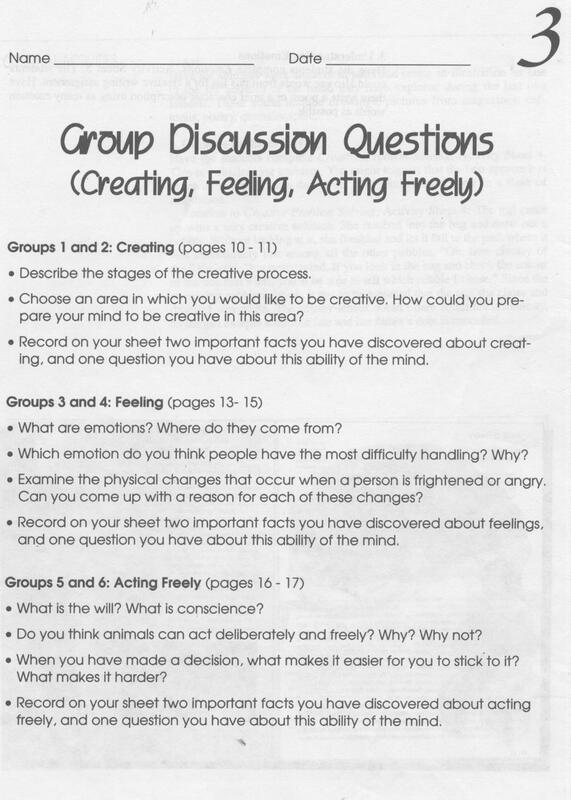 Using their Fully Alive textbooks (and their own previous knowledge), they are responsible for recording responses to questions in small groups. They will be provided with chart paper and markers and will (during the next gathering) share their information with the rest of the class. Students will peer and self assess group members for their efforts during the class time given. Can one person change the world? What does it mean to leave a legacy? For the project, students have the option of researching an individual whose talents range from visual art to sports to music to science (and more), as well as individuals from different places, times, and backgrounds. As the students work on the project, they are to focus on the main idea of, "What did the life story of this person teach me about changing the world and how might I contribute to changing the world in my own small way?" The students will have three research/ design periods using the class set of laptop computers. For the subjects of Religion and Life Curriculum I like to get well into the unit of study before I assign a theme page to give the students some better clues as to what to include for theme ideas. The criteria remains the same as previous theme pages in other subject areas. Over the first month of school, we have looked at aspects of humanity that make us unique amongst God's creations. We have been given the abilities to create, reason, remember, act freely (free will), learn and feel emotions to an extent far beyond the capacity of other animals and plants on Earth. This elevates the status of humans, but leaves us with "extra" responsibilities to consider about how we nourish and protect our planet. During this unit you were forced to research an individual who has used his/her time on the Earth to "leave a legacy" (http://bit.ly/RQgDbC). 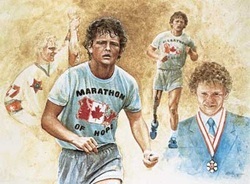 People like: Terry Fox, Harriet Tubman, Princess Diana, Ghandi, Martin Luther King, Inky Johnson etc. Individuals like these provide us with models for how we should conduct ourselves. By examining their caring nature and willingness to sacrifice for others we are forced to ask ourselves, "What can I do with my time on Earth to help those around me to live a better life?). Unfortunately, we were also forced to spend some time examining how we can abuse our time on Earth by seeking out sinful and distructive behaviour. We focussed on aspects surrounding hurtful words and actions (bullying) that cause us to stray away from the path of righteousness, why we choose these actions sometimes and how to make amends afterwords. The overwhelming message is that we need to celebrate our good deeds far more than we mourn our misdeeds. At the completion of this point of the unit, I like to turn the attention of the students to our first Religion unit entitled, "The Gifts of the Holy Spirit." Therefore, you will need to look under this tab for the next series of lessons. Thanks.